There is no band more dynamic or more intimate than a husband and wife duo. They spend half of their lives entertaining each other and spend the other half entertaining their audiences, together. They eat, snore, and get up on stage together and both sides of their relationship are dependent on the other, but Brian Fields and Michelle Tafoya make it look like it is just as much a part of their life as breathing. Their chemistry on and off stage looks perfectly natural, just like a proper rock n’ roll couple should, like Sonny and Cher or Johnny and June. Except it isn’t exactly straight forward rock n’ roll they are singing. It’s a genre called “trop-rock” with a mix of folk, country, classic rock and anything to fit the scene. Actually, they like to call it “Nautical Americana” and rightfully so. Trop-rock has a deceptive reputation for having only one type of sound to it. Their version does not. Brian and Michelle like to mix up their playlist with whatever mood the crowd is in. They aim to entertain everyone. For those who don’t know, trop-rock is the name for a style of music that is heavily influenced by island rhythms and often credited to Jimmy Buffet and his loyal following of Parrotheads. Which would make sense that there is still trop-rock included in their sets since Brian and Michelle first came to Key West because of the annual Meeting of the Minds festival which celebrated its 26th year in a row last year. However, they weren’t yet doing shows together at the time. That would come a few years after they got to know each other. In a world far away from this one. Their musical story started when Brian, who had previously dabbled in bands including one called the Garage Boys, as the front man of B-Man and the MizzBeeHavens decided to add some female vocals to the group. 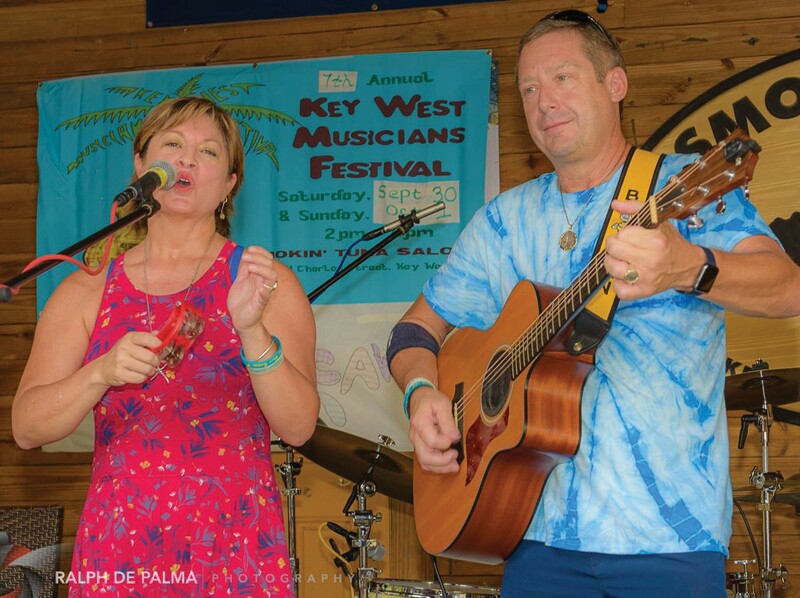 Ever since then the two have been combining musical talents — him on guitar and vocals, and her on percussion and vocals, and are now known around town as B-Man and mi-Shell. Michelle learned harmony from nuns as a child in Pueblo, Colo/. while Brian taught himself the guitar at the age of 13 as a kid in Ohio. They were both young when music made its impact on their lives and both strongly agree that it can be an important part of growing up. “It upsets me when I hear that they are taking music programs away from schools,” Michelle says passionately. If you have any problems, questions, or comments regarding www.FloridaWeekly.com, please contact our Webmaster. Copyright © 2007—2019 Florida Media Group LLC.